Scorpio's love of the mysterious naturally occurs at the dinner table. Scorpio can be obsessive about the process of cooking and the result, especially if it involves recipe secrets of any sort. The process of life and death fascinates Scorpio, even in the kitchen. The transition of a live crab to its cooked meat dipped in warmed butter appeals to Scorpio's perspective on life and death. It also whets the appetite. Scorpios will even go out of his way to uncover a chef's secret recipe and delight in finding what special spices are used. Scorpios sometimes won't rest until they discover every ingredient in a recipe. An undetectable spice will drive a Scorpio mad. Sydney Omarr goes so far in his book Sydney Omarr's Cooking with Astrology to state that a Scorpio's desire for intense flavors are so strong that they are likely to like Limburger cheese. 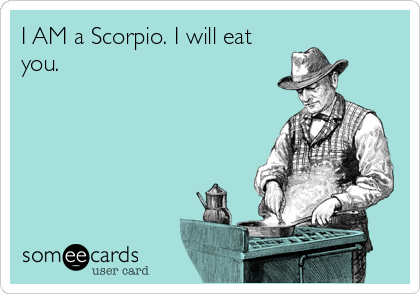 Scorpio has the self-discipline to stick to even the most sacrificial and spartan diet. An all-or-nothing approach to dieting spells success for Scorpios. Hence, weight loss is easier for Scorpio than any other sign. Scorpios should be cautious and avoid being overly zealous about extreme dieting, fad diets, and excessive exercise. Scorpios, because of their powerful will can obsess over weight issues. Those born under Scorpio can become anorexic or bulemic. Scorpio Nadia Comaneci, Olympic gymnast suffered from bulemia for years. Luckily for Scorpios, eating disorders and food obsessions are usually short-term phases. Scorpios are the power-houses of the zodiac to have what it takes to heal themselves. They then become wonderful healing mentors for those who admire their diet results and find that others are eager to learn from them. Also, Shellfish, Strawberries, Onions, Brown Rice, Millet, Wheat Grass, Lettuce, Celery, Fresh Vegetable Juices, Cherries, Oranges, Rhubarb.